September 02, 2015, 3:36 p.m. The ongoing controversy surrounding Planned Parenthood risks limiting access to testing for sexually transmitted diseases (STDs). The state of Georgia recently stopped providing Planned Parenthood with STD testing kits, despite Georgia having some of the highest STD infection rates in the country. The Center for Disease Control and Prevention makes clear that easy access to STD testing is a critical component of any public health program to limit and eradicate STDs. YouGov&apos;s latest research shows that 39% of Americans say that they have been tested for an STD at least once. 15% of Americans also say that, either now or in the past, they have regularly had STD tests. Men are no more likely than women to have undergone regular testing, but black Americans (31%) and Hispanics (33%) are significantly more likely than white Americans (9%) to say that they have been regularly tested. The vast majority of the Americans public (80%) support the provision of free STD tests by local governments. 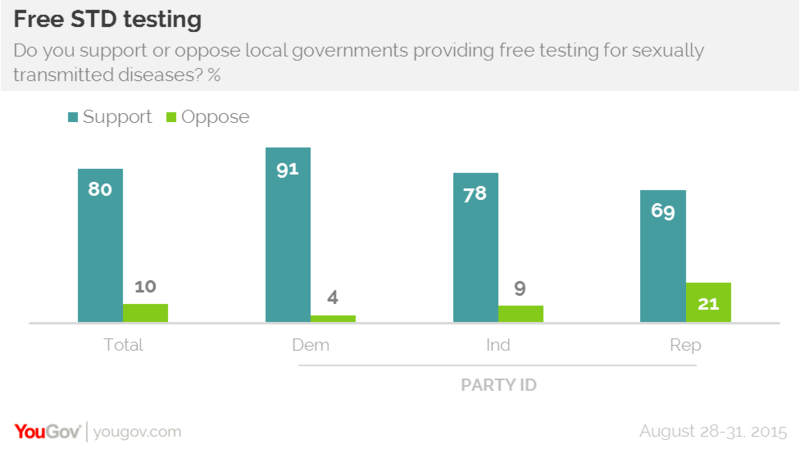 Only 10% oppose the idea of their local government providing people with a test for STDs, for free. Support for the proposal crosses political lines, with over two-thirds (69%) of Republicans supporting the plan along with 91% of Democrats. When it comes to treating sexually transmitted diseases among high schoolers, the public is more split. This is especially true if high schoolers could be treated for STDs without their parents&apos; knowledge. 39% of Americans support providing medical treatment for high schoolers with STDs without necessarily informing their parents but 46% oppose it. Democrats (49% to 34%) tend to support the idea, but Republicans are largely opposed (64% to 28%). Significant budget cuts to disease control in New York City, which has one of highest rate of new HIV infections in the country, has seen the number of publicly provided HIV tests drop by 36% since 2008 even as rates of STD infections have jumped in the city.